Changes have been made to the championship belt gallery over at TopRopeBelts.com. The gallery changes offer new ways to browse and share the belts while providing links back to their owners. 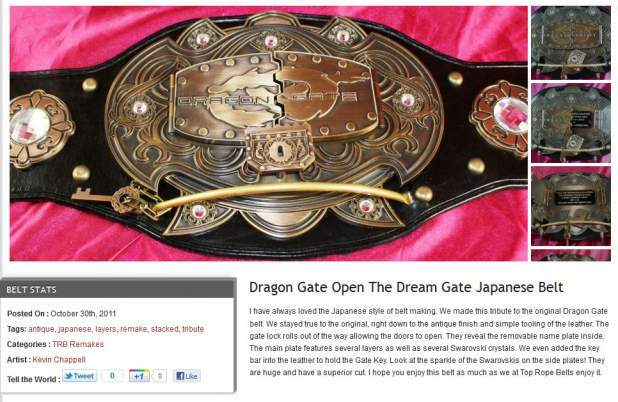 This is a great way for a company or wrestling league that bought a belt from TRB to get incoming links to their organization’s website. The previous gallery featured a page of thumbnails with a description of the belt. clicking a thumbnail would bring up the large view and the user was forced to navigate from page to page to view all images. The new gallery condenses the entire gallery to a single page which makes browsing the images faster and reduces the bandwidth usage. Discussion is also kept to one page making the comments easier to follow too. Podiatristnyc.com is the Advanced Footcare Group website for renowned podiatrist Dr. Howard D. Zaiff, DPM, FACFAS. Dr. Zaiff was particularly fond of flash websites so my approach was to add animation an AJAX content retrieval for any areas that could use it. This meant content that did not require a layout change such as the Services and Treatments sections. To keep the site quick to load the makes heavy use of cache, popular external libraries and maintains a small footprint despite large images. The AJAX functions help also by only loading about 15kb-50kb of data (depending number on images) on some clicks. Other unique items about the site are 2 custom plugins to that allow users to make appointments and a gallery plugin that extends the default WordPress gallery. The gallery plugin, Z-Gallery, can handle local and external video sources, uses AJAX and has modal popups.